Every year around this time reports surface that take stock of South Africa’s performance over the past year. For the past four years this has ended with a sigh and a browbeaten shake of the head. I am of course referring to the spectrum of global performance reports that measure factors affecting economic growth, social and development performance and the broad spectrum of useful indicators within each report. South Africa’s past scores have been mediocre but more worrisome is some of these indices’ recent downward trend. While these indicators show whether a country is improving year on year, they also rank states according to their scores. This puts a country’s performance in a global context and makes useful comparisons possible, but with comparison comes an impact on confidence. 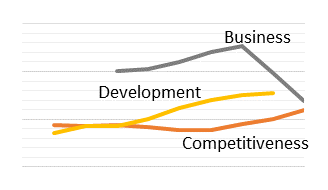 Last year business confidence in South Africa was very low, as evident in the EU Chamber of Commerce and Industry in Southern Africa Business Climate Survey, researched and compiled by Tutwa Consulting in collaboration with Imani Development. It’s worth noting that the global indices are based on surveys and one could argue that low public opinion could lead to low performance, a self-fulfilling prophecy of sorts. In this light I briefly review three important global indices to gauge what clues they give us regarding South Africa’s economic and development trajectory. This report measures 12 pillars of competitiveness including sets of institutions, policies, and factors that set the sustainable current and medium-term levels of economic prosperity. These range from basic requirements to efﬁciency enhancers, and innovation and sophistication factors affecting the aggregate ranking. It’s a fairly sophisticated index, with states’ scores weighted according to their development status. For South Africa more weight is awarded to higher education and training, efficient goods markets, well-functioning labour markets, developed financial markets, the ability to harness the benefits of existing technologies, and a large domestic or foreign market as South Africa is deemed to be a Stage 2 (efficiency driven) economy. The country has managed to climb seven places in this year’s GCI rankings and is currently ranked the 49th most competitive country in the world. However South Africa’s score (ranges from 1 to 7) saw only a marginal 0.04 point improvement. This puts South Africa ahead of all SACU members, second in sub-Saharan Africa (Mauritius ranked 46th) and third among BRICS peers. According to the report South Africa’s improvement is largely due to uptake of ICT technology and improvements in innovation, but the highest-ranking individual competitiveness pillar remains South Africa’s financial market. This page gives a breakdown of South Africa’s key economic indicators and the 12 competitiveness pillars including their rank, score, and trend. This index, as the name suggests, is much more concerned about a state’s population, specifically their development and well-being, issues that the aggregate economic performance or business performance of a particular state do not reveal. The index measures three broad aspects: life expectancy, education, and per capita income. Effectively the HDI scores a country’s population according to their capabilities. This is a rather important index since aggregate economic indicators, like GDP per capita, in isolation give a skewed perception of a country’s well being given the effects of economic disparity. Unfortunately South Africa is one of the world’s most unequal societies with an income distribution heavily weighted towards a small group of the population (a Gini coefficient of 63.1) which has an impact on the average life expectancy and education. Rather interestingly the communist state, Cuba, scores much higher in the HDI (ranked 44th) than the majority of democratic states in the world, while reported life expectancy for North Korea (Democratic People’s Rep. of) was much higher than South Africa’s. Though it has to be said South Africa’s life expectancy has never been very high and currently stands at 56.9 years compared to 51.6 years in 2006, but these figures have to be taken with a pinch, if not a teaspoon, of salt as war torn states like Palestine, Syria, and Sudan have life expectancies exceeding 62 years. South Africa’s mean years of schooling, measured at 9.9 years in 2012, is the 55th highest in the world and is only 3 years less than the highest ranked countries (Germany and USA) with 12.9 years, however the quality of education is debateable. South Africa’s GNI per capita of US$ 11 788 ranks it 88th in the world. In the last Human Development Report index, using data from 2013, South Africa was ranked 118th out of 187 states, which doesn’t even make it the best performing country in the SACU (Botswana ranked 109th), but the HDI score has been increasing since 2005, albeit remarkably slow. The next edition of the UNDP HDR is expected on the 14th December 2015. The World Bank’s report boasts that it is able to give objective measures of business regulations for local firms at a national, and increasingly, sub-national level. It looks at domestic small and medium-size companies and measures the regulations applying to them through their life cycle by gathering and analysing comprehensive quantitative data to compare business regulation environments across economies and over time. This means that the Doing Business report is a measure of regulatory ease, or as the title would suggest the ease of doing business, with the rankings comparing economies with one another and the ‘distance to frontier’ scores benchmarking economies with respect to regulatory best practice. In the 2016 edition of the Doing Business report South Africa’s national representative city was, like all reports before, Johannesburg. The report has since expanded to include subnational analyses of South Africa’s nine largest cities’ Doing Business scores available here. Regrettably South Africa dropped four spots in the global ranking and currently stands at 73rd out of 189 economies. There was also a decrease in South Africa’s distance to frontier score which according to the report can be attributed to an increase in the cost of registering property, the cost of dealing with construction permits, and the recovery rate of resolving insolvency. The biggest problem however is not the marginal decrease in these three indicators but rather stagnation of five of the ten indicators and improvement in only two. 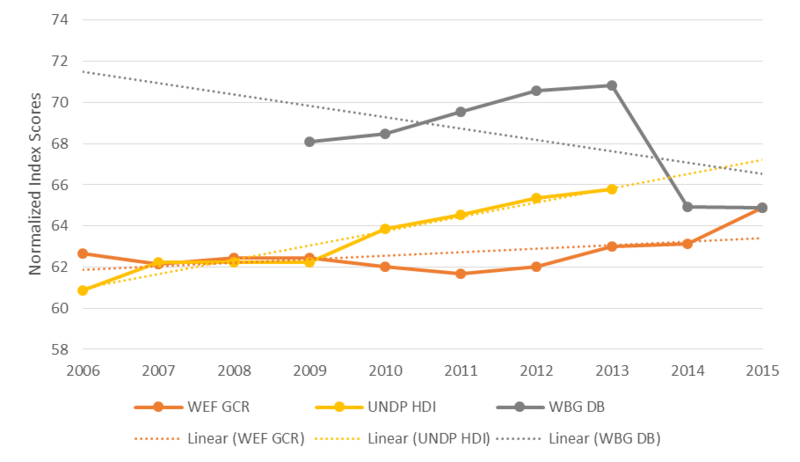 The linear trend lines in Figure 1 show long-term improvement for both the HDI and the GCR but a sharp medium term decline for the Doing Business Index. While the HDI and GCR trends look favourable they tell only half the story. Yes, South Africa’s HDI and GCI scores are improving but compared to the rest of the world’s South Africa’s progress is slow; and in terms of global ranking South Africa is being surpassed by more rapidly developing states. This can mean that investors looking to expand into developing markets might reconsider investing in South Africa as alternative investment destinations seem to be more reactive to global best practices, international competition and societal development. The Doing Business report, more so than the other reports, is one that should be read with great intent by South Africa’s national government as it measures and points out regulatory (in)efficiencies within a state. These require simple changes in the number of procedures, associated costs and time to completion; which in the grander scheme of things (economic disparity, wide spread poverty, large scale unemployment and low economic growth) are the low hanging fruit. As pointed out in Catherine Grant’s ‘Private Sector Development in Botswana’ article it is in the country’s best interest to develop the private sector, which also means fostering a supportive business environment. Whether making policy changes based on global indices will translate into better scores and rankings in other global indices, and more importantly better real social and economic conditions, will only be known once these changes have been implemented. Suffice to say it’s best an eye be kept on countries making a concerted effort to climb global index rankings and what the long and medium term effects are as supposed to dismissing critical yet useful insights.